Last summer I really got into nail art, trying out different designs and keeping my nails exciting, but recently I've been stuck in a rut with the same French Manicure Shellac. Don't get me wrong I love having a French Manicure - it looks so clean, classy and polished. Summer is definitely the best time to dust off the neon polishes and try out something a bit different. This design was quite easy and only took 4 different polishes - Models Own 3 in 1 for the base and top coat, Barry M Matt White for the dots and base, Models Own Bubblegum for the neon triangle and Andrea Fulerton Stripe and Sparkle in Black for the animal print design. 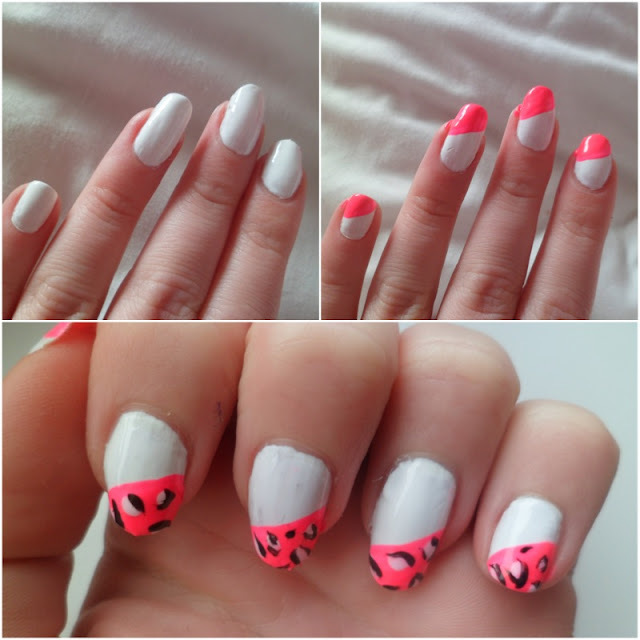 If you've done any nail art recently I'd love if you leave your link!